Uncle, one hei mee without hei! I remember saying this at desperate situations... ordering a bowl of hei mee (prawn noodle) without hei (meaning prawns in Hokkien). I had to do this whenever my friends invited me to eat with them at their favourite hei mee place. Sometimes, these specific coffee shops that sells nothing but their famous hei mee. So, the sad me had to make this accommodating request to avoid any social-suicide and also survive through my fresh prawns allergy. Yes... You are the nice BUTTERY marble butter cake that I like. Since young, we used to celebrate our Chinese New Year with Bengawan Solo marble butter cakes... I don't know why but I guess we did this because my father likes butter cakes. Maybe it is just me and my opinion... I can't help to think that most typical Westerners' kind of butter cakes are typically rich in butter content with compact texture. Most of the typical butter cake recipes that I have seen are the ones that were made with creaming of butter and sugar first and then with the additions of eggs, milk, flour and raising agents. These recipes don't require any separation of eggs and their methods of mixing is usually straightforward and easy. Whereas, some of the Asian-originated fully-packed butter cakes that I know are less compact with tender crumbs and finer texture. In actual fact, these two recipes are exactly the same recipe as it originally comes from Life is great. Mixing this butter cake requires separation of eggs and it is maximally loaded with butter... Yeah, lots of butter! There is no other liquids like milk, or yogurt in this recipe. Just eggs and minimal flour to bind the maximal amount of butter. I would highly recommend this butter cake recipe if you are a butter cake lover. It is seriously buttery but delightfully light with subtle fluffiness. I have to say that I really have nothing to complain about this recipe except that the mixing of this cake batter can be quite lay-chay (meaning troublesome in Hokkien). Lay-chay???... As mentioned in the recipe, two electric mixers are required to bake this cake or unless you have very strong arm muscles... LOL! I need to use both a stand mixer and a hand mixer to bake this cake. Very lay-chay! To start, whisk egg yolks with sugar until light and combined. ... and combine both together! Ai ya! There is a crack on the cake surface! Not perfect? Not Perfect? Nay! For me, I can ignore the crack. This cake is perfectly buttery with delightfully fluffy texture. Here's the recipe that is adapted from Life is Great - Updated on 14 July 2016. A reader has requested me to re-write the recipe with showing any modifications and so this is exact recipe that I have used. Preheat oven at 180°C or 160°C (fan forced) with a wire rack in the middle. Line one 14 cm round cake tin with baking paper. Sift flour, baking powder and salt in a bowl. Set aside. 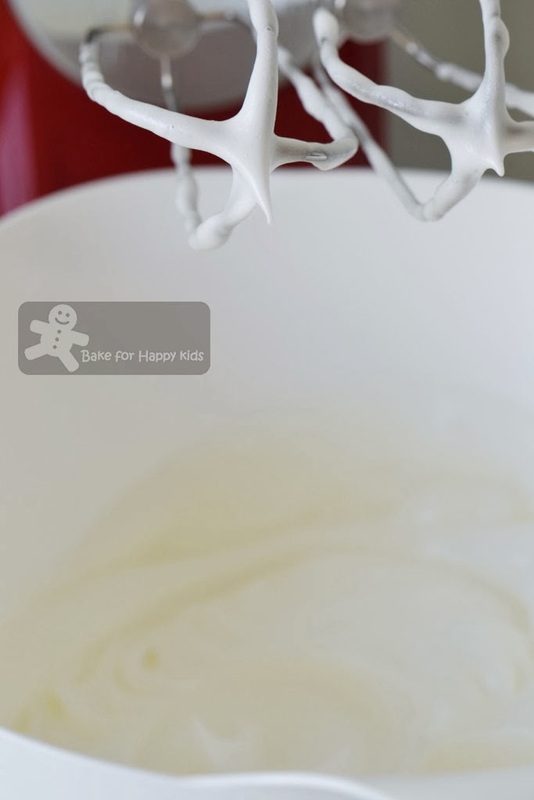 Cream butter in the bowl of a stand mixer fitted with the paddle attachment till light and fluffy. 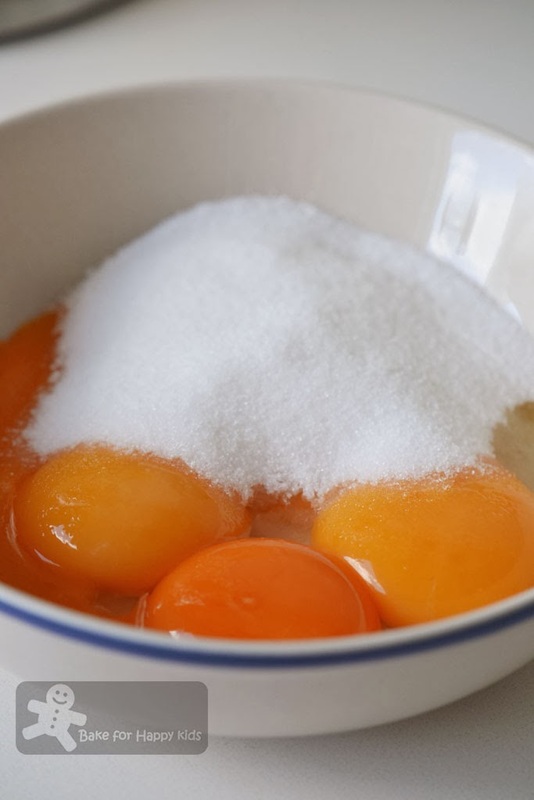 In a separate bowl, whisk egg yolks with sugar until light and combined. 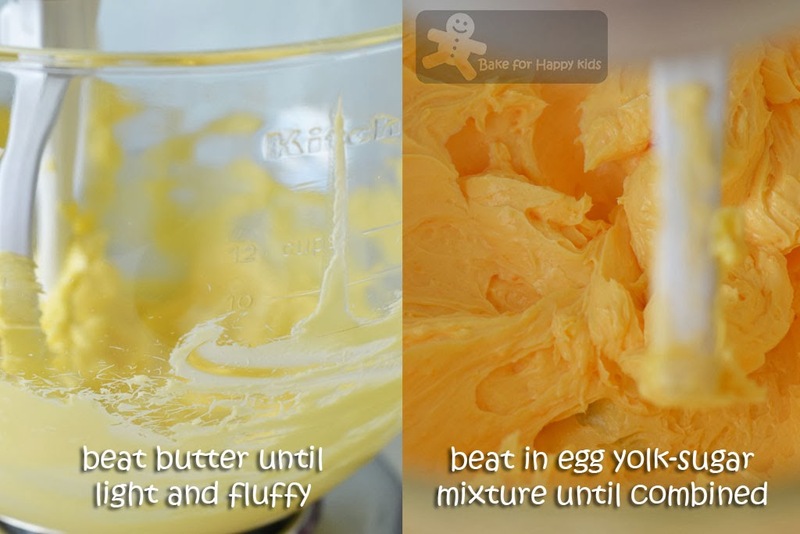 Gradually add egg yolk mixture into the butter and beat on medium speed till just incorporated. In a separate bowl, with a hand mixer in medium, whisk egg whites until stiff peaks form, in about 10 mins. 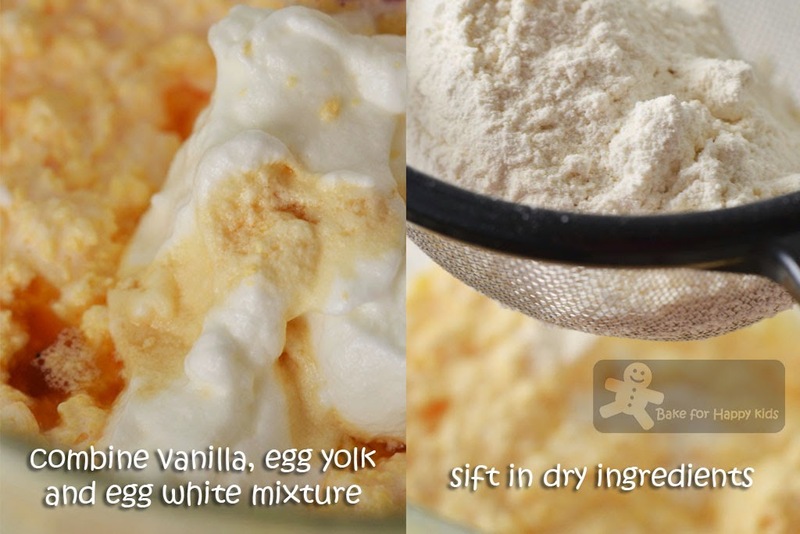 Use a spatula to fold in the egg white mixture into the egg yolk mixture in 3-4 batches. Add in vanilla extract and dry ingredients. Stir gradually until just incorporated. Divide the batter into two, 3/4 in one portion and the rest in another portion. 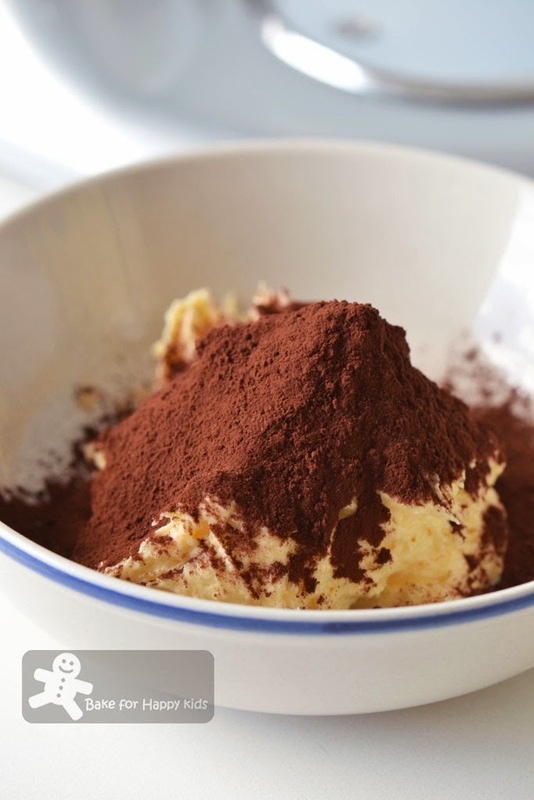 Sieve cocoa powder over the smaller portion and fold to mix well. 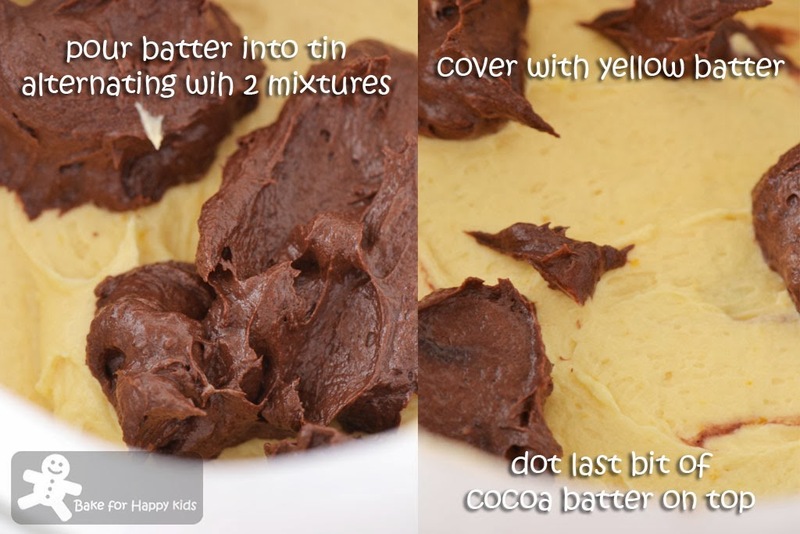 Pour batter into tin, alternating between the two mixtures, starting with the yellow batter and ending with the cocoa mixture. Tap the filled tin on kitchen top gently to eliminate any air bubbles. 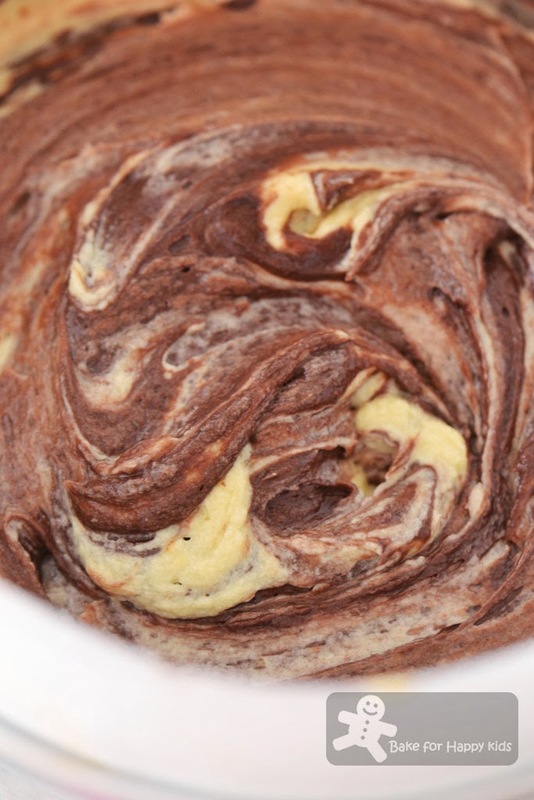 With a long skewer, swirl around the batter to create the marble effect. Bake for 40-55 mins or until a tester inserted into the middle of the cake come out clean. Allow cake to cool slightly in the tin for about 10 mins and transfer onto a wire rack to cool completely before serving. Cake keeps at room temperature up to three days and can be frozen up to 3 months. There is also another recipe that I really keen to bake which is this famous Mrs Ng SK's butter cake by Wendy, Table for 2 which many Asians have baked this recipe in the form of marbled butter cake too. After loading myself with this delicious butter cake, I'm feeling a little guilty after enjoying this cake... My thighs, tummy and brain are telling me that I need to take a break now and will love to bake this recipe in the near future. Thank god you converted your recipes into grams and also halve the recipe.. When I see 8 large eggs, I was like oh dear, who's gonna eat all that coz my hubs doesn't like cake.. I'm book marking this as well, will follow your remarks in blue.. I love butter cake..
Of course, I won't drink the prawn soup... It is super deadly for me. I will be ugly and disfigured for a while before zyrtec kick in!!! Hello hello! Do you know that in Malaysia, some wonton mee doesn't come with wonton but just s few slices of badly dyed "char siew," it's kind of weird, hahaha. Just recently I found out that you are allergic to fresh prawns! By the way, your butter cake has certainly captured my eyes, I love it! Love marble cake! Vanilla and chocolate pairs with each other wonderfully. I grow up eating butter cake and especially loves those buttery flavour in it. The more butter in it the more better as I once tasted butter cake that is so dry and makes me so hard to swallow down. Your pic says it all...and I think I can smell the aroma as well too. I love butter cake. Probably that's when my parents started to feed with the only type of cake back then. I remembered once I ate until I got hospitalized..haha. No joke. Yet I still love butter cake till today. Wow, you have done your homework for Marble Butter Cakes! This cake does sound rich with the amount of butter and eggs. I supposed that these contributes to the tender and fluffiness of the cake. Lovely cake, Zoe! I remember too, when buying marble cakes from bakeries, they are light and fluffy, but only those from the bakeries. Over the years, I've sort of divert my preference for denser texture, but equally moist and tender. Hi Zoe, nice marbled butter cake and your cake is definitely loaded with butter. Yum! Perfect with a cup of coffee. I, too prefer to separate my eggs whenever I make butter cake, I find that the texture is fine and tender. Your cake reminds me of the rich butter cake from Yut Kee in KL. Is definitely disappointed eating HarMee(we call this in my hometown) without any shrimp right? BTW,this butter cake really looks soft & buttery,LOVE it! Love your marble patterns looks so pretty! I'm sure we all love butter cake with or without marble. Hi Zoe! I used to yuks butter cake but now I love it! It is my dad's favourite cake too and the egg separation method is really worth the trouble. hi zoe, it's been really long that i hv nvr baked a butter cake..i will need to bookmark this recipe first..yes bookmark again! LOL! i really dont mind the calories since i'm not eating it very often! Cheers buddy! 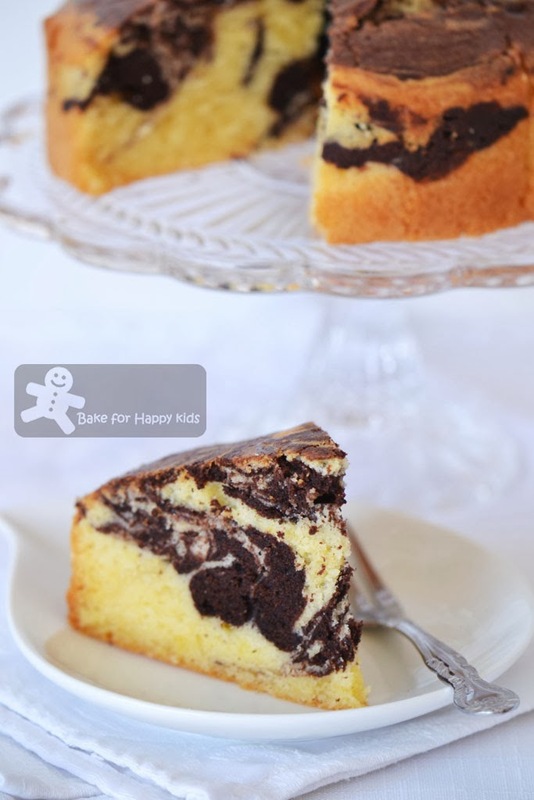 Your marbled cake looks so lovely! Hi Zoe, your recipe posts are always so illustrative with step by step photos. 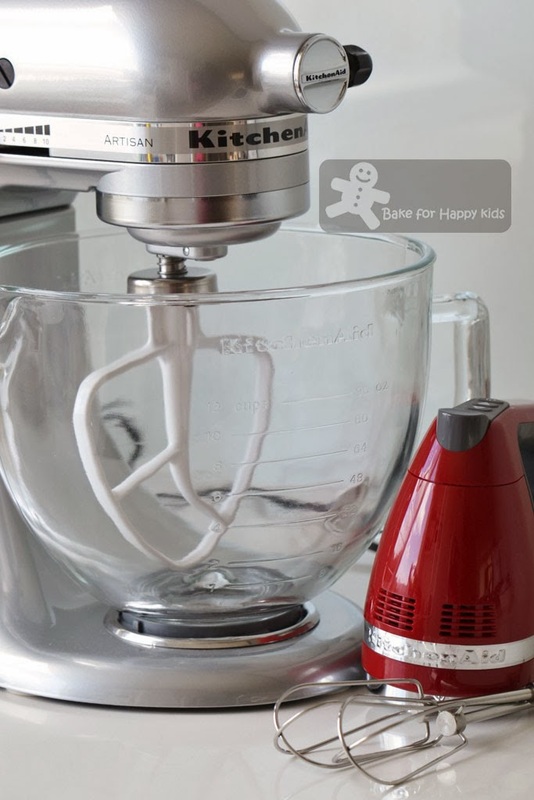 At a glance, it tells that it is not difficult to bake a cake. Thanks for the inspiration. I promise I'll try baking as many as possible that are shared here at Bake Along, hehehe! I'm glad Lena chose this theme too, Zoe. I've been nibbling on everyone's Marble Cake this morning, lol...I didn't know there was a difference in buttery marble cake and not so buttery. I would LOVE a buttery piece please. Your marbling looks so swirly too, lol...Thank you so much for sharing, Zoe...Now I crave a piece of buttery Marble Cake! Haha one can definitely NOT make marble butter cake without rich fatty butter. The more the better! Since we're already indulging anyway, right. Last two years, hubby bought me marble cake for my birthday - everyone in my family likes it! Cake looks absolutely stunning, very buttery and delicious..
Hi Zoe, this looks so good, I like the marble effect. wow......Marble.butter cake looks awesum !! Thanks for following me. I tried to follow you but seems GFC has error, do check if I'm following you or not! 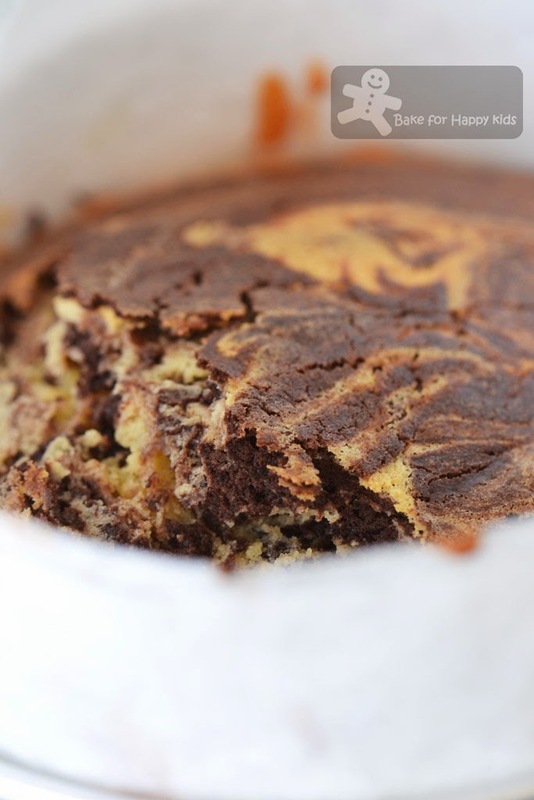 I love marble cake... we call it the best of two worlds :) Looks so delicious ! Funny lah you, Zoe! I was scratching my head while reading the hei mee thingy. Hahaha! Gosh, I've to admit your marble cake looks real yummy. Need 2 mixers?? Nevermind, I shall wait to be served. Sorry for not coming by lately as I've been really busy. Have a lovely weekend, sweetie! Nothing will ever replace butter! It's sooo good and really makes a cake from standard to amazing. Looks beautifully marbled too! 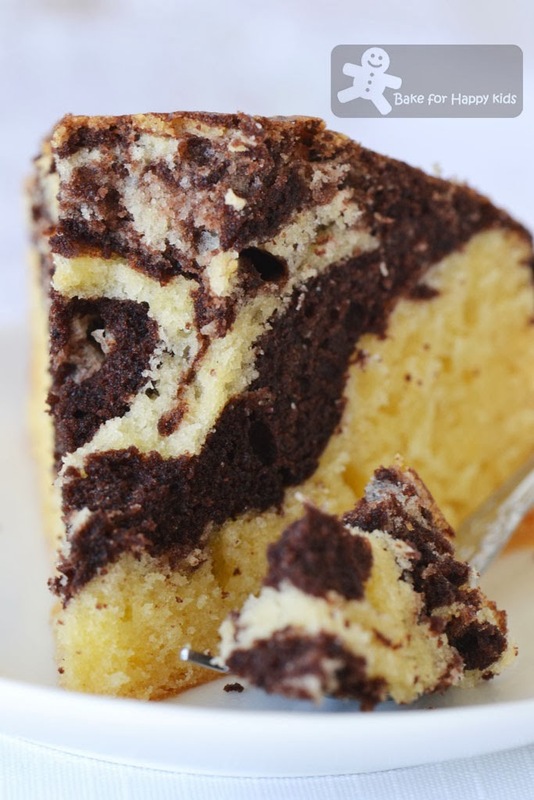 Like your dad, marble cake is my hubby's favourite with lots of childhood memories. Every time when I ask him what to bake, the answer is marble cake! The one in Australia has 3 colours while the one we grow up with has 2 and much more buttery without any icing. Nice work! Butter cake without butter? Definitely NOT! I made the same cake too and the texture is perfect! yum, yum butter marble cake!! I always wanted to try this cake. I have a similar recipe but I like your revised version better. Your photos are great! Hello,just wanna double confirm wif the number of eggs in the recipe as the original recipe calls for 8 eggs,since u made only half of the recipe but still using 8 eggs? The original recipe containing 8 eggs can make two 14 cm round cakes. I have used half of the recipe to bake just one. Cheers! I just baked marble cake follow your recipe and temperature but the outcome is not satisfied. Outside lool good with tiny crack but the inside is a bit wet. Mum said no cake texture. Just want to check is it the temperature too hot? Have you test your cake with a inserted skewer before removing it from the oven? If the cake is not thoroughly cooked in the oven, its inside will be wet. If the outside of the cake is browning too fast, cover the cake loosely with a foil and bake until the skewer instead come out clean. Hope that this will help. Hi Zoe, I am writing from Colorado. I tried your recipe today and followed it to a "T". However, I found it hard to fold the whipped egg white into the batter? How long should I beat the egg whites? So the cake came out dry. Not sure what happened... it looked nice though. thanks for sharing! Nice to hear from you from Colorado. Sorry for my late reply as I was away for my holidays. I can't really tell you the exact timing that you should beat your egg whites. The best way to gauge is to beat them until they form stiff peaks but do not over beat them as they can make the cake really dry! I don't think it is difficult to fold the egg whites into the batter. You just have to do by batches and gently. Please do not deflate the egg whites by over-mixing the batter. Another thing, the cake might be dry due to your oven setting and also the size of the eggs that you used. Please make sure that you are using the larger eggs (at least 60g-70g with shell) and also do not over bake the cake or use too high temperature. Hope that you will get good result for your next bake. Cheers! Hi Zoe, I have the same qn as Agnes too.. The original calls for 8 eggs and makes one 20cm cake. You didn't half the eggs number whereas all other ingredients are halved. Is this correct? Sorry for this confusion. I should re-write this recipe when I wrote this post :p My answer to Agnes's question is "The original recipe contains 8 eggs which makes two 14 cm or one 20 cm round cake/s. I have used half of the recipe to bake just one 14 cm round cake. Hope that this is clear enough. Ops! There is typo error. It should be 3/4 tsp baking powder and 3/4 tsp vanilla extract. Cheers! You are an inspiration to me! I'll keep following your recipes. Will try this butter cake this weekend and will inform you of the outcome! Glad to hear that you had great success baking the lava cakes and will be trying this recipe at this weekend. Happy Baking! OH yes, to add, yah I think it'll be great if you could amend the portion on the no. of eggs. Hehehehe.. Bet many readers are confused as me. :) No offence. Alright... will try to change if I have time. Cheer! Good luck with your baking! Hi, I have changed the recipe according to your request. Happy Baking!